Manchester City’s January transfer window proved to be less exciting than last year, when they broke the club record to bring in Aymeric Laporte. In December and early January, rumours of a new midfield signing and even a left-back persisted, but it soon became clear that despite the odd interesting story – such as a bizarre link to Schalke’s Sebastian Rudy – nothing major was going to happen. Summer promises to be much more eventful. Few may realise, but City’s net spend is negligible to nil this season. The £60 million club-record fee for Riyad Mahrez has largely been offset by the sales of young players, including a couple in January. It wasn’t a month without deals, so let’s have a look at what did happen in January, and what could happen come summer time. Manchester City’s main intention this month was to try and secure a player for June. That was the exciting Ajax midfielder Frenkie de Jong, who became the subject of a tug-of-war between City, Barcelona and Paris Saint-Germain. It was quite a saga, with media in different countries all having different stories. City seemed to fade in the race and it became more of a Barcelona vs. PSG shoot-out, which Barcelona eventually won. So why did City pull out? De Telegraaf journalist Marcel van der Kraan had a stunning claim towards the end of January, stating that De Jong wanted City and had a meeting with Guardiola, but ‘internal issues’, possibly linked to Financial Fair Play, stopped it happening. A damn shame, if true. In the end, City’s big signing of the January window was a player the club haven’t even announced – the Croatia under-19 captain Ante Palaversa, a prodigious midfielder with great potential as Tribina editor Dino Grgić told City Watch. Palaversa cost around £4.1 million up-front, with more to follow, and returned to Hajduk Split on loan until 2020. City also signed – and also didn’t announce – a young Japanese defender by the name of Ko Itakura, who arrived from Kawasaki Frontale for an unknown fee. A versatile 21-year-old defender, Itakura was immediately loaned to FC Groningen in the Netherlands until the summer of 2020. Unlike Palaversa, who you sense City have plans for, Itakura feels like one of those City Football Group investments they will look to profit on in a couple of year’s time. As far as we know, that was it for the incomings. It is possible some academy players arrived under the radar, and City were trying to get Espanyol wonderkid Oscar Tarensi in, but there have been no updates on that. The two most high profile departures in January were youth players, deals which told us several things. Firstly, that the CFA is producing high-level talent, even if many of them are not breaking through to the first team in the same way Phil Foden has. Secondly, the very fact it is so hard to break into the senior squad means City are now prey for clubs from abroad offering these players a quicker pathway to the men’s game. Brahim Diaz quit the Etihad, joining Real Madrid for an initial £15.5 million, potentially rising to £22 million. A huge fee for a fairly unproven teenager with six months left on his deal, but Madrid were paranoid of rival competition and wanted him in as soon as possible. It was a shame to lose Brahim, but with Sané, Sterling, Mahrez and even Bernardo ahead of him as wing options, you can hardly blame him. Perhaps he could have chosen more wisely though, if it really was about game time (and not sunshine), with Madrid reportedly already thinking of loaning him out. Brahim left in early January and at the tail-end of the month, Rabbi Matondo was lured to the Bundesliga by Schalke 04 for a fee the English press say is an initial £9.6 million. Matondo is a lightning quick winger but his only experience in the senior game is 12 minutes off the bench for Wales against Albania. Then again, that’s 12 minutes more than Jadon Sancho had before he left for Borussia Dortmund. One thing City ensured with Matondo that they failed to with Sancho, is a buy-back clause for a fixed fee. The Blues have a first option on Sancho but that only allows them to match any successful bids. There were plenty of loan exits in January, notably the highly-rated Venezuelan international Yangel Herrera who joined La Liga basement boys Huesca until the end of the season after a couple of years with sister club New York City FC. Huesca look doomed to relegation but the experience of Spain’s top flight will be good for 21-year-old Herrera, who could have a bright football in the European game. One of the most disappointing signings of recent years has been Marlos Moreno, who was sent back to City by Flamengo in January. The young Colombia winger was linked with clubs all over the shop, but ended up in Mexico with Santos Laguna, where he’ll hopefully fare better than he did in Spain and Brazil. 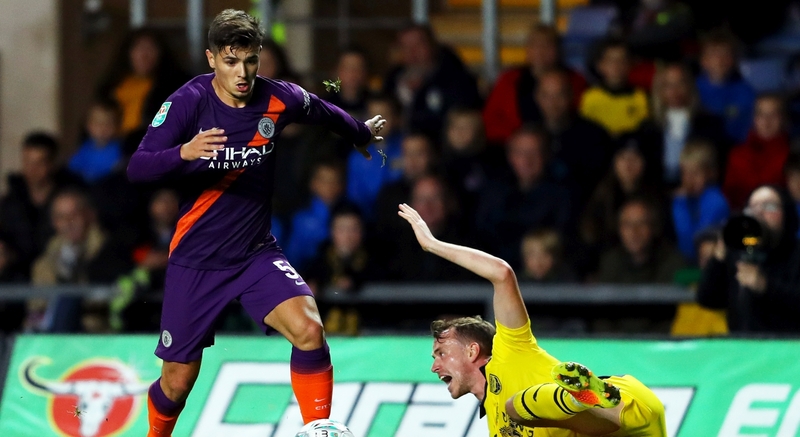 Another young winger who has struggled in Europe is Mexico under-21 international Uriel Antuna, who was returned to City one-and-a-half seasons into a two season loan deal by FC Groningen, the same club that Ko Itakura was sent to (not as a replacement, since they play different roles). Antuna is set for an interesting experience in the USA with Los Angeles Galaxy, where he will play alongside Zlatan Ibrahimovic and the Dos Santos brothers. Probably better than Groningen’s reserve team. Continuing the trend of terminated loans, Anthony Caceres, another of those CFG signings we’ll never see in the sky blue of Man City, had his latest loan spell at sister club Melbourne City cut short, and joined Sydney FC on loan. Luke Bolton made a big impression in pre-season, particularly when the homegrown right-sided attacker left Fabinho for dead against Liverpool. Bolton has plenty of potential and was sent out for his first loan spell in January, joining Wycombe Wanderers until the end of the season. Another young defender, Edward Francis, returned from a loan spell in the Netherlands with Almere City to join Premier League side Wolves for an undisclosed fee. Republic of Ireland youth international Ryan Corrigan, a left-back, was the final player out of the Etihad departure lounge in January, heading to Stoke City on a permanent deal shortly before the deadline. And lastly, as we already mentioned, Ante Palaversa returned to Hajduk Split on loan after joining the club on deadline day. City can recall the youngster in January 2020 – otherwise, he’ll be back at the Etihad in the summer of that year. P.S. Eliaquim Mangala is still here after City found no one willing to take him on loan. His contract is up in June, something that must bring Txiki Begiristain great relief. The spectre of Financial Fair Play is hanging over Manchester City’s head again after the Football Leaks documents, which you have to admit were pretty damning – but may not hold up in court since they were hacked. Even so, if the theory that City missed out on Frenkie de Jong due to FFP concerns is true, you can only wonder how it’ll impact next summer’s business. Our guess is not too much because City don’t need a batch of new players, just some strategic signings. The Blues already have a deal in place to sign USA number one Zack Steffen who is arriving from the Columbus Crew in July. It is unknown if he will be granted a work permit yet – if he is, he will become number two to Ederson, with Claudio Bravo probably out the door and Aro Muric likely heading on loan. If Steffen isn’t eligible for a work permit, he will be loaned out, with Patrick Vieira’s Nice mooted as a possible location. The number one priority next summer will be a ‘No 6’, a holding midfielder. A Pep Guardiola holding midfielder isn’t just a player who will go sliding in with crunching tackles – it is a player who can run the game from deep, a player who can press, tackle, pass and read the game well. Essentially, he wants a player much like Fernandinho, which is much easier said than done. A host of names, not all of them of similar styles and profiles, are being linked. For example, two Lyon midfielders, Tanguy Ndombele and Houssem Aouar, are said to be on Guardiola’s radar. They are completely different players, so which profile is it that Pep wants? Other midfield names to have been mentioned are Napoli’s Allan who even PSG were priced out of a deal for in January, begging the question – do City want to sit around the negotiating table with Aurelio De Laurentiis again? Txiki may say f**k that. Ruben Neves of Wolves is a very appealing option and it may be doable, but the figures involved are likely to be huge, with Wolves not short of cash and a very ambitious club with no desire to sell. Adrien Rabiot, formerly of City’s academy, will be a free transfer option but talk of City wanting him has cooled. One player who may be easier to sign is West Ham’s Declan Rice, a real talent, but is he good enough for City? It’s intriguing to wonder who will end up being Fernandinho’s successor. It’s a role not just any player can take, but one who needs a very specific skill set. Benjamin Mendy returned from a second serious injury only for his knee to swell up, sidelining him again. Who knows – he may get over that and never be injured again. But our suspicion is Pep is growing tired of his absences and will bring in a second natural left-back in the summer. And the chosen one, according to reports, may well be Leicester and England youngster Ben Chilwell, a 22-year-old with great potential who is already making a name for himself in the Premier League. If Guardiola wants a more proven option, then there are whispers of Juventus star Alex Sandro possibly being on the market next summer. Real Betis’ Junior Firpo is another name on the radar, with Real Madrid and Arsenal also keen on him. Another position that may be looked at is centre-back. Why would that be, you ask, with four established options on the books and prospects such as Eric Garcia and Philippe Sandler showing promise? The answer is that Vincent Kompany clearly cannot be relied on to play much anymore, and Pep seemed almost to have given up on the captain being around regularly when asked prior to the Arsenal game. Guardiola also claimed Nicolas Otamendi may not be happy with his rotational role, so his future could come in question. There are two pieces of evidence that suggest City might want a centre-back: number one is that very reliable sources in France and Spain said City had a deal in place for Toulouse centre-back Jean-Clair Todibo last month, but he forced through a move to Barcelona instead. Secondly, Dutch source Voetbal International says City are the ‘main bidder’ for Ajax’s Matthijs de Ligt, who is a generational talent, almost too good to miss out on if there’s a chance. The problem again may be Barcelona, who the 19-year-old is said to be keen on joining. What about the right-back position? Recent evidence suggests Kyle Walker is on the decline and while Danilo has been generally playing well, is City’s right side secure enough for next season? It may be a question of budget, with this position unlikely to be a priority yet unless there is a truckload of cash to spend. If there is, Aaron Wan-Bissaka of Crystal Palace, another young English full-back like Chilwell, could be the one Pep has in mind. The final question is about the forward position. This is also an area Guardiola might not address until the summer of 2020, but something is going to have to happen there eventually. Sergio Aguero is 31 in June and when his contract is up in 2021, it’s almost certain he’ll be on his way. The only other natural striker is Gabriel Jesus, who is finally on a good run of form, but has been prone to barren periods, raising questions of if he can be City’s number one striker in the future. Perhaps, if an enticing option presents itself in the next transfer window, City might consider bringing someone in for that position. To facilitate incomings, players may have to leave in the summer. Oleksandr Zinchenko is likely to be on his way after almost joining Wolves last summer. Fabian Delph‘s future is in question with Guardiola not favouring him much of late – but there are stories of a contract extension and his homegrown status might mean he’s kept around as a squad player. Vincent Kompany is out of contract and questions will be asked there until he renews. As mentioned, Nicolas Otamendi may consider a move if an appealing offer arrives. It’s hard to see many changes in the midfield and attack. Some would question if Ilkay Gundogan will stick around, but Guardiola values his German midfielder and unless Ilkay pushes for a transfer, he is unlikely to be going anywhere.